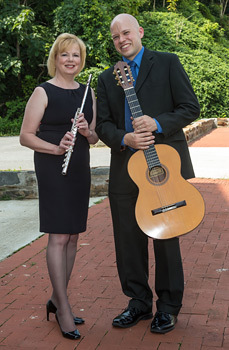 Duo Bellezza, a musical collaboration between Alycia Hugo, flute; and Sean Beavers, guitar, will present a faculty concert on February 27 at 7:30 p.m. in Sydnor Performance Hall. The program will feature selections by Carulli, Bach, Albéniz, Bartók, Bozza, Massenet, Lynds and Beaser. Alycia Hugo is principal flutist with the Roanoke and Lynchburg Symphony orchestras and is on the performance faculties of University of Lynchburg, Liberty University, Randolph College and Sweet Briar College. Sean Beavers serves as associate dean of music and performing arts in the Liberty University School of Music. He teaches applied guitar and directs the Liberty University Guitar Ensemble.